Students in Oklahoma premier Mayron Coles new operetta, Magic Meadow! Show us your stuff and put your photos here! We want to show YOU off! If you'd like to submit photos showing you and your students in action, please send either a regular photograph (and well scan it; photos will be returned) or a scanned image saved as a jpg to the Mayron Cole Music Conservatory. See our Contact page for mailing instructions. 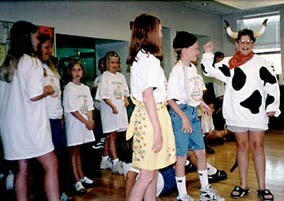 Students in Iowa rehearse for their performance of Mayron Cole's "Jack and the Beanstalk" operetta. 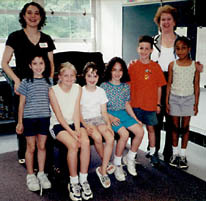 Mayron Cole, second from right, visits a Mayron Cole Piano Method class in Maryland. Their teacher is Laura Flowers. 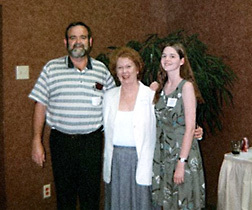 Oklahoma teachers Kimsey Wade and his daughter, Charlotte Wade, pose with Mayron Cole (center) after the Oklahoma City certification seminar. Kimsey and Charlotte's piano studio produces many church musicians for their part of Oklahoma. 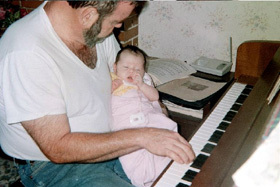 Proud grandfather and piano teacher, Kimsey Wade, introduces his grand-daughter to the piano. Certification Seminars are no longer presented aroung the country because we now have a complete seminar by Mayron on a 2-DVD set or 2-VHS for you to order and complete at your leisure. There is even a workbook and certifcation "test" to turn in after you finish the presentation. This is not required to teach the Mayron Cole Piano Method, but it is highly recommended. Simply click on the "VIDEO" bar at the top of this page for more information. Another Oklahoma teacher, Rana McCoy (right) poses with Mayron Cole and Bill Cole after the Oklahoma City certification seminar. 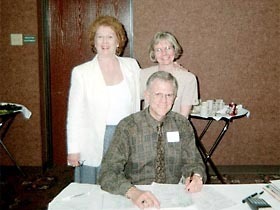 Rana's summer music/drama workshop produces many of Mayron Cole's operettas. The workshop auditions are open to all the children in Rana's hometown.